This GINGA TOP is half sleeve summer top. When you purchase this pattern you will also receive GINGA TOP -winter sky (3/4 sleeve version) as a separate pdf. GINGA TOP is available in both English and Japanese. This GINGA TOP, meaning Galaxy in Japanese, features a beautiful Diamond Mesh stitch, like shining diamond stars in the sky, on the yoke and border with a swingy A-line shape and relaxed shirt tail hem. This top is begun with a provisional cast-on at the upper back, then worked back and forth to the shoulder top. The right and left yokes are divided for working separately until they are joined at the base of the V-neck. The front and back yokes are worked separately to the underarm. 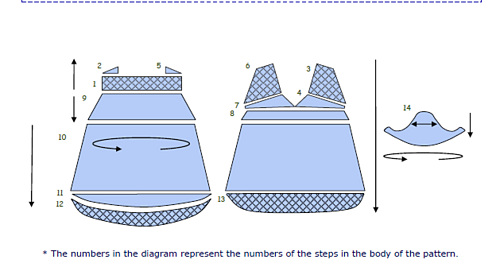 The body is worked in the round until the hem. The Sleeves are picked up around the armhole and worked in the round from the top down. This top includes lots of short-rows to shape the shoulders, the neckline, the hem and the cap sleeves. SLEEVES—3.5 mm (US 4): set of 4 double-pointed needle unless you use the magic loop method. This pattern has been tested by these excellent knitters.